I'm trying to decide how to propose to my girlfriend. We've been dating some time now (almost 3 weeks!) and I feel we're ready for a bigger commitment. Should I go for low key, maybe take her to a park or something of that nature? Or should I propose at a ballgame or her sister's upcoming wedding? What's the best tactic? Firstly, it's Marty, not Martin. Second, I had no idea I had readers in Switzerland. Now to the topic at hand. It seems to me like you may be rushing things a little here. I remember a few years back I went through something similar. This was before I knew cow. I had, while flitting around a pasture, struck up a conversation with a goat. It wasn't long at all before I was riding the goat. But it just wasn't meant to be. The two of us were completely incompatible. From then on I learned to take things slow; get to really know someone before I rode them. 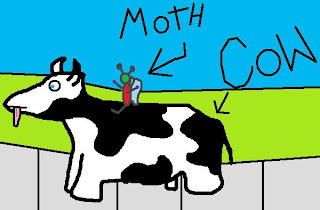 I was friends with cow for a long time before I finally got on board. So do yourself and your girl a favor and wait at least another week. Being a moth, I can only think on moth terms. We moths don't live very long, only a few weeks. We can't afford to waste time. I think long engagements are out. Just do it. I only knew my wife for a few minutes before I proposed. I had a friend who had a very long engagement, I think it was almost a week. That is too long. I'm with Joe. My husband and I knew each other for 3 long months before getting engaged and then another excruciating 3 months after that, before getting hitched. Clearly, we were overly cautious. When I think of the 5 months, 2 weeks and 3 days that we could have 'just been married already', I feel an acute sense of loss and more than a little gypped. The best advice I can offer you 'I DO' is the less time you've spent getting to know one another... the more over the top you'll have to make that proposal. Excellent advice. Wait. I'm listening to a moth now. Yeah, what the hell is going on here? You people are agreeing with a moth that knows cow but previously started riding a goat without any foreplay. I mean, forethought. And your human relations resemble same? (Mine don't, but I don't exactly have any.) Furthermore, do they actually play ball in Switzerland? PS I love this silly post, TS. i will tell you this.... after jason and i "Reconnected," which was pretty much meeting for the first time.... we were engaged on day 16.!!!! yes, day 16!!!!! and we got married on like day 65 or something.... yes, we were nuts. and i'm CERTAIN EVERYONE thought we were nuts.... the only person who resisted just a bit, was his dad. i had my mom and pat's support 100%.... they knew i wouldn't get married if i wasn't sure. All's fair in love and symbiotic lust. Personally I think you two crazy kids should go see a Godzilla vs. Mothra movie. Sound advice! If you love it, give it a week before deciding your fate.